A quintessential part of any young kid’s upbringing is the sleepover. Technically, it should be transcribed “Sleep: Over” since it’s the termination of any sleep for a good 24 hours, including that of Mum & Dad and any neighbourhood dogs. I had a great many sleepovers with a great many people, although now as I type it out it all sounds a little Bond film-ish. My first Bolivian sleepover was at Seth’s house, and was outside in the backyard under the stars. Literally under the stars: our tent consisted of a double mattress and some blankets. This was a mistake. While Cochabamba is high in the Andes, dusty and remote, the dew falls like rain on the plain in Spain. This meant by the time we got close to sleeping, around 5am, everything was so damp and cold even Seth’s Pekingese had given up and crawled from out of my underwear to find refuge inside the house. To combat the wetness, we employed an electric lamp, sans shade, and basked in the warm incendiary glow of the bare bulb we secreted under the covers. Somehow no one died. Or slept. For future sleepovers we upgraded to the luxurious comfort of sheets draped over play equipment. At least when I stayed at Joel’s we were inside and dry. I was too shy to ask for a mattress, and he never offered, so I usually slept on the thin Bolivian carpet, which was comfortable enough, compared to say; sleeping naked on a pile of Lego, or my straw mattress full of bugs back home. The only dampness was between my legs, because I couldn’t bare to walk past Magnum P.I. watching late night TV on my way to the toilet. Often, a clothes peg, placed gingerly in the right spot, would stave off any midnight accidents. This did nothing of course to stop Joel urinating all over me. On one sleepover, the toilet wasn’t even an option. Laddy, (his actual name) invited me to his house, which was amazing, because he and his brother lived in a room in the backyard outside the main house and we could do whatever we liked. Except urinate. Because we were all white kids we were kidnapping bait, so using the separate toilet 5 yards away at night was forbidden. This meant any bodily excretions were cheerfully deposited in a peanut butter jar we could all share for the night. I winced when I saw it and prayed it was remnants of Kraft Crunchy I was seeing inside the lip of the jar. I’m not sure what happened to its’ contents the following day. I don’t care to think about it. Sorry, but jar-filling isn’t happening on my watch. I’ll be honest: I can hold my bladder for a long time. Days probably. 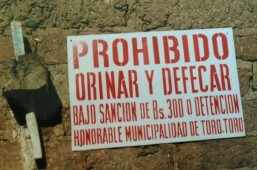 I think this is because Bolivian public toilets are seedy hives of pestilence, plus the single square of toilet paper you had to purchase on the way in usually felt like plywood. They should have sold sachets of vegetable oil too. This meant I could last for ages without a single drop. I can put up with excruciating pain in my kidneys for hours before doing anything about it. Prodding my lower back now, they feel like hacky sacks full of cement. I’ve probably got a stone coming on the size of a Toyota Yaris. A different story on ‘jar night’ however. My bladder, which I’m donating to the NFL when I die, was letting me down. The brothers maintained in no uncertain terms that using the toilet outside was still off limits. Unless, of course, I had a number 2 coming, in which case, everything was dandy. Perhaps it dawned on them that sharing the Kraft jar with a 3rd party took away some of the fun factor. It’s also common knowledge a kid who’s prairie-dogging is a decidedly less attractive option for kidnappers. Shamefully, I lied and said I did in fact have a bowel movement resembling a baby buffalo on the way, and with feigned humility said I was still happy to use the jar, if they could supply some kind of kitchen implement, or perhaps a spare index finger, to help guide it all in there. Surely they had a spare putty scraper they could forgo? Maybe bring a 2nd backup jar just in case. This was all bluff on my part. I had no desire to start my own pickle company. Thankfully, the boys declined my selfless gesture and with a sigh of joy that could have been a little more discreet on my part, the door was finally unlocked. I spent about 15 glorious minutes losing around 10% of my body weight, knowing this was my only chance. Good thing too. By then my pee had the consistency and colour of fresh lemonade. Of course, as you age, things stop working as well as they once did, and airtight seals unbroken for years start to fail. Before I was married I used to sleep over at my girlfriend’s family’s house, playing xbox or watching horrible movies no one else could stomach, with her younger brother. One Christmas Eve I awoke in the middle of the night with the front of my pants decidedly warm and damp. Not cool for a 27 year-old. The spare mattress I was sleeping on was pretty wet too. Nervously I sniffed around a bit, a little reluctant to accept the truth. I couldn’t smell anything too foul, although I was drinking more water in those days. I snuck off to the bathroom and changed, returned to the mattress and slept on the edge that was still dry. In the morning, I made sure I was up before anyone else, which is hard on Christmas day, and flipped the mattress over, covering up the wet patch on the floor with some clothes so I could return later and erase any evidence of the crime. Perhaps with some air freshener or QuickLime. Drunk in the frenzy that comes with opening thousands of expensive presents from one’s inlaws, I soon completely forgot about my geriatric urinary tract. Until lunch time, when my mother in law found the mattress and I was busted cold. I slumped in my chair at the table, dying inside and waiting for the inevitable as she quizzed Chris on the mattress. I’d never felt more relieved, regardless of what I was sitting on. Hilarious Arden. A baby buffalo has me in tears…as it no doubt would have had you in pain as it led its herd through death valley. Thanks Chris. Of course, everything you read here is entirely based on facts.